It all started with a simple dream: to complete my first novel. It took about three years – plus another two to type up the handwritten manuscript – but I did it. By the time I was finished transcribing, my heart was crowded with more dreams: write some short stories, get published digitally, get published in print, learn to write a screenplay, pen a piece of fanfiction (and have the guts to actually post it). One by one, all of these dreams came true…save #3. I love getting published in e-zines for many reasons: your story is free for anyone to read, you can link to it on your website, and it’s just a great thing to have a sample of your work in such an easily accessible format – not to mention the awesomeness of instant reader feedback! But I must admit there’s something magical about being published in print. Just seeing your story in the pages of a book, being able to hold it in your hands and run your fingertips over the words…I wanted that. I think a lot of writers do. And, for one reason or another, the dream just kept drifting out of reach. My very first acceptance was for a print newspaper in the city where I attended college. I was thrilled. Then it didn’t happen. No explanation, never heard from the editor again. I spent long months feeling baffled and hurt, then eventually moved on. My next acceptance – or, as I like to call it, my first real acceptance – came from Every Day Fiction. One of the many things that drew me to them was that they were a digital market, but they also put out an annual print anthology of their best stories. Sadly, they stopped doing this shortly after I started submitting to them. As far as I know, they’ve never restarted. I think it was just too expensive. Completely understandable, but once again, I had to put the dream on hold. Then, just last year, I got the acceptance I’d been waiting for: one of my stories had been selected for a print children’s collection. Cloud Nine, here I come…right? Wrong. In December, I received an email from the publisher that they were no longer doing multi-author children’s collections and there was no guarantee they would ever publish my story. I started to think I might be cursed. I started to think this particular dream would have to stay just that: a dream. I started to think maybe it was time to let it go. Thankfully, I didn’t listen to those little whispering cockroaches of doubt. I kept submitting to print markets, and finally, it paid off. A few months ago, as I shared right here on ATHF, I received notification that my story “The Greatest Gift” would be published in Chicken Soup for the Soul: The Cat Did What? But the awesomeness didn’t stop there. A few weeks after that, I got another email from Chicken Soup for the Soul: my dog story, “Legacy,” had been selected to appear in Chicken Soup for the Soul: The Dog Did What? A few weeks after that, the unimaginable happened: my werewolf story, “Burn,” was accepted to appear in the August 2014 issue of Trysts of Fate, a dark paranormal romance magazine presented by Alban Lake Publishing. A print magazine. After all those times the dream had slipped away, it seemed just too good to be true. When the hyper excitement wore off, I began to worry that maybe it was too good to be true. Both of these publishers were very reputable, but still, I’d been burned in the past – multiple times. I couldn’t truly let myself believe – not until I could hold the books in my hands. Like, for real. In mid-July, I got my wish: the first batch of contributor’s copies arrived, and I ran my fingers over the glossy cover of Chicken Soup for the Soul: The Dog Did What? for the very first time. I touched my name on the page, saw my words in print at long last. Less than a week later, I was holding a contributor’s copy of Chicken Soup for the Soul: The Cat Did What?, caressing the pages, smelling the crispness of fresh ink on paper. Then, about a month after that, my third baby arrived. Trysts of Fate was just as glossy as the other two, the striking cover art looking even better in person than it had on the publisher’s website. There was even something special about just knowing that they were advance copies – something most people weren’t able to read or touch just yet. Nowadays, of course, anyone can hold my babies. Anyone can read them. The Chicken Soup books officially came out on August 19th, and can be purchased in bookstores and online. 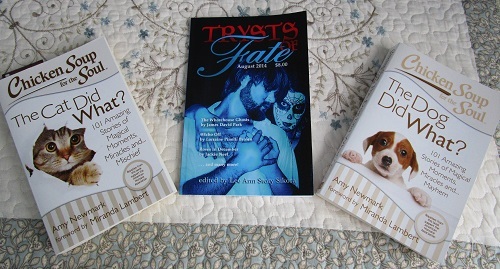 The August 2014 issue of Trysts of Fate is available in Alban Lake Publishing’s online store. So, now that I’ve had a month or so to bask in the glory, what’s next? More dreams, of course! I have so many waiting in the wings: do a non-profit book signing, run a workshop with my writing group, finish my nano novel (yeah, still working on that…I think it’s become a trilogy at this point), have one of my stories illustrated, write a TV pilot, write a spec script for Castle, write a movie script, attend the Austin Film Festival, and of course the biggie – become a published novelist! But that’s just me – what about you? What are your writing dreams, and how are you pursuing them? Maybe the only difference between a dream and a goal is doing something to make it happen…or simply not giving up the hope that it actually could.